In a world-first, Montreal’s Cirque du Soleil will open a resident show in China next summer, and Stratford’s Ballinran Entertainment will be tagging along for the ride. 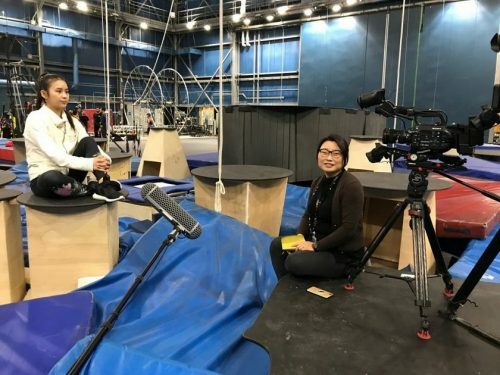 According to the production company’s founder, Craig Thompson, his team and that of Toronto’s White Pine Pictures are set to follow 50 acrobats — half of which are from China — as they prepare for Cirque du Soleil’s The Land of Fantasy, set to open next summer in the company’s first theatre built outside of North America, in the southern Chinese city of Hangzhou. Having already begun filming the acrobats as they train at Cirque du Soleil’s headquarters in Montreal, the Ballinran and White Pine production crew will travel with them to China in January to capture the show’s development right up until it hits the stage on opening night. “Our documentary really isn’t about what happens on stage, it’s more about what happens behind the scenes. The casting of the show is different than any other Cirque du Soleil show. There are 50 acrobats in the show; half of them are from China, half of them are totally unfamiliar with English and unfamiliar with the Cirque du Soleil’s style. The rest of them are from about a dozen countries around the world, so it’s really a chance to explore the east-west connection between China and the rest of the world, and what we have in common, rather than what we don’t,” Craig Thompson said. Though a production filmed in China can often take some time to get going, Koi Thompson, Craig Thompson’s wife and a permanent resident in Canada from China, and a Fanshawe film-making graduate working at Ballinran, also from China, have helped the production team navigate the rules and regulations, and the cultural and language challenges that come with a project of this kind. Koi Thompson is even producing a Chinese-language version of the documentary so it can be viewed in China, as well as Canada and other English-speaking countries around the world. “I’m sure (the Chinese government and people) are going to embrace this film when it’s released,” Craig Thompson said. The documentary is one of a number of projects with the potential of capturing international interest that Ballinran has taken on in recent years in an effort to create a film and television hub in Stratford. Craig Thompson has also spearheaded such film-related events in Stratford as Queen of the Square Cinema and Movies Under the Stars. “I’m really, really pushing to get more film and television production in Stratford. We’ve had some examples recently of shows coming to Stratford to film, but I think there’s a real potential for expansion of the media industry in southwestern Ontario, especially if Toronto gets more challenging in terms of a place, not only to film, but also to live,” Craig Thompson said.